Wow, it's already mid-September. I hope everyone had a wonderful summer! Here in the Los Angeles suburbs, it reached 108 last weekend. 108! It has definitely been one of the warmest in my memory. That said, I managed to finish two projects since I last updated. I made another Coffee Bean Cardigan, this time for a baby girl, and also decided to make something for myself: The Gemini Pullover, which was featured in the Spring/Summer 2012 issue of Knitty.com. I love the part of the yoke which features a lace panel, and the easy-fit style of the tee. I don't like tight-fitting garments so this would definitely going to be a perfect Spring/Summer wardrobe staple. After one sleeve done, and pre-blocking. It definitely needed to be blocked for the lace panel to open up and for the neck opening edge to not curl. The yarn I used is Cotlin from KnitPicks. The cotton/linen blend was a teeny bit itchy but nothing too terrible. So glad to have a finished project for the summer! Now I'm going back to work on the Silver Cardigan, and also started a new project for a baby boy: Baby Sophisticate. I finally finished this set for a baby girl, yay! The bonnet is the February Baby Bonnet (inspired by Elizabeth Zimmermann) by Margot Erdmann, and the sweater is of course the Baby Surprise Jacket by Elizabeth Zimmermann. This was a fun set to knit and put together. I was going to knit a simple hat when I decided to browse Ravelry and came across this bonnet pattern that I love. I just packed it up and tomorrow it will go to a friend with a baby girl. It's a surprise so I hope she will like it! I've got two more babies to knit for. Both are girls, so it's going to be fun looking for new projects to knit! I started a new knitting project a few days ago. I'm still knitting for babies! So many babies have arrived or are due to arrive within my circles of friends and family. I wanted to try something new that's perfect for Spring and Summer, and the lovely Silver Cardigan is perfect with its short sleeves and cute diamond lace pattern. I love the smock/a-line style too, perfect for a little girl. I'm using sport-weight yarn here but I'm sure it'll work great in worsted weight to fit an adult too! I'm sure it'll look great over a tanktop or a long sleeve tee for cooler days. Can't wait to see how it turns out! Webs Yarn Store Blog Mention! I am so glad it's Friday. It's been a long and gloomy week here in LA. 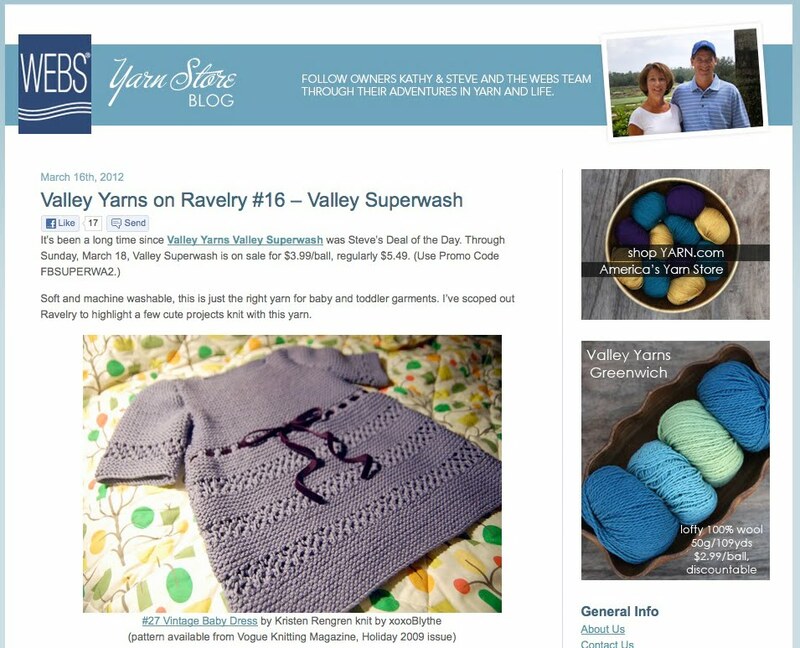 And what a nice surprise to come home to - my Vintage Baby Dress was mentioned on the WEBS Yarn Store Blog today as a great project using Valley Yarns Valley Superwash! Thank you kindly for the mention, Dena ! And as luck would have it, Valley Superwash is Steve’s Deal of the Day. Through Sunday, March 18, Valley Superwash is on sale for $3.99/ball, regularly $5.49. (Use Promo Code FBSUPERWA2). I'm going to add more to my stash!! Surprise! It's a Baby Jacket! Yay, it's a new knitting project! I haven't been knitting much in the past few months because I moved! The new place is slightly bigger and I now have a larger craft room/studio! We're still living amongst boxes and stacks of books/clothes/etc., so it will take a while for things to be back to normal. So those of you who are seasoned knitters or are "EZ fans" already know what this is. For those who don't - doesn't the WIP above look like a rectangle gone terribly wrong or a sad attempt at knitting a rainbow-colored animal hide?! I fell in love with the Lovely Leaf Lace Scarf which was featured in PurlSoho's 2010 calendar. The leaf pattern is indeed very lovely! Instead of cashmere (because who has the luxury of knitting with cashmere nowadays?) I am using Caron Naturally Spa Yarn in Misty Taupe. It's a really beautiful color with a bit of sheen (acrylic/bamboo blend). It's also very soft and drapey which I think would work with the leafy pattern quite well. I didn't want to make the scarf too wide, so I cast on one less repeat. It's been so long since I knitted in lace, so I took a while to get used the leaf pattern, but it should be a lovely gift next holiday season! Oh my goodness, I finally finished the Bamboo Diamond Shell. A year and seven months in the making (okay, I knitted it off and on and put it away for months and months), I finally decided to wear it for the first time today since it was a mild mid-70F day in Los Angeles. The Valley Yarns Southwick bamboo cotton blend (from WEBS/Yarn.com) kept me nice and warm and it felt really comfortable against my skin too. I love the retro styling! And the button is vintage too! I scored it at one of my favorite flea markets and have been saving it for years to go with the perfect garment. I actually had all the pieces (collar, bodice, and waist band) finished for months and just couldn't bring myself to seam them together. And that said, if you ever see me wear this in person, please don't look too closely at the seams! I really need to get myself to a "finishing school" or class one of these days. Can you believe we have 50 more knitting days until Christmas?! This year has gone by way too fast. I've only done three projects for myself (so many more in the queue!) but I have to start knitting holiday gifts soon! 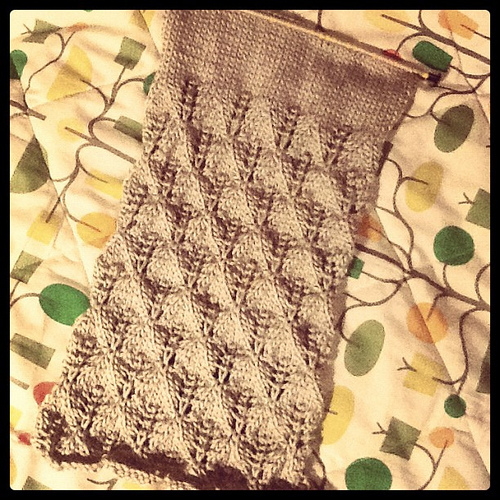 The pattern is "Bamboo Diamond Shell" from Boutique Knits. I love this book! I started knitting when I was about 14, but never finished my first project because I had no patience. 20-some years later, I'm still not very patient, but I've managed to finish quite a few projects since I picked up my knitting needles again in 2004. I am constantly learning new things with every project I start. I highly recommend knitting to anyone who wants to give it a try. I guarantee you will become more mellow, more patient, more generous, and find it most satisfying. It's the best hobby ever!